Submitted photo Jessica Schneider and Fairborn City School District Superintendent Gene Lolli. FAIRBORN — A Fairborn High School student has been named the top senior in Greene County and was recognized at the state-level. 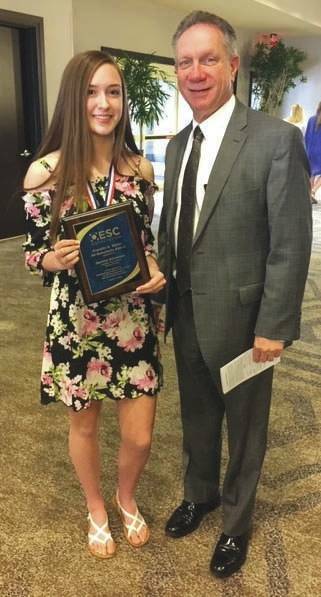 Jessica Schnieder was selected by the Greene County Educational Service Center as the top senior in the county and has received the Franklin B. Walter All-Scholastic Award. Seniors from every county in the state were recognized April 12 in Columbus. According to FHS Principal Amy Gayheart, Schneider plans to pursue pharmaceutical chemistry at the University of Dayton next year. According to Fairborn City Schools, the Greene County Educational Services Center asks each public school in the district to submit one nominee from the schools to be considered for the Ohio Educational Service Center Association (OESCA) Franklin B. Walter Award Recipient. The nominees are selected based upon ACT/SAT scores, academic grades during the high school career, school and community activities and awards as well as the student goal statement. A press release by Fairborn City Schools said the Franklin B. Walter All-Scholastic Award was created to honor Franklin B. Walter, a former Ohio state superintendent who served from March 1977 through August 1991, to recognize one top student from each Ohio county. In addition to receiving the state recognition, the Greene County recipient since 2005 also receives a staff scholarship of $1,000. According to FCS, the scholarship is funded thanks to donations from ESC staff members as well as proceeds gathered from the annual ESC Scholars Golf Scramble. https://www.fairborndailyherald.com/wp-content/uploads/sites/50/2019/04/web1_topsenior.jpgSubmitted photo Jessica Schneider and Fairborn City School District Superintendent Gene Lolli.